Our House ticks all the boxes for today’s thriving thriller market and well deserves to do so. It is set in everyday life and it makes full use of social media, striking chords from the very first page. 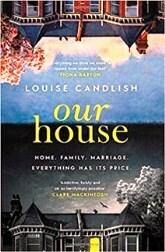 Most of us can share a shiver with Fiona Lawson who returns home to find it isn’t there anymore; the house is there, but the furnishings and possessions are not hers. Nor does Fi recognise the stranger who opens the door with the news that she has bought the house, moved in today and has never heard of Fiona Lawson. Nor has she heard of Fi’s estranged husband Bram, who shares the house and their two children on a part time basis. All their possessions have vanished. The nightmare that unfolds is told largely from the victim’s side, much of it is a transcript of her podcast. But who is the victim? Fi indisputably, but what of Bram? Is he a victim too? And what of the secrets they have been hiding from each other? The plot is as remarkable as the way in which the tale is told, Fi’s side of events mainly from her podcast, and Bram’s in a Word document. The intricate timings and detailed twists slow the pace from time to time, but soon add up to a memorable tour-de-force, culminating in an ending you won’t forget.